In early March, DBC’s Ramona Rutert and Martin Walter travelled across the pond to ITB Berlin, the world’s largest tourism trade show. The annual event brings together hotels, airlines, tour operators and DMOs to discuss travel trends, establish business connections and foster new partnerships. While in Germany, Ramona and Martin met with eight tour operator partners to discuss market status, new itineraries and joint marketing opportunities. These discussions were primarily influenced by DBC’s marketing focus to promote shoulder season travel and wildlife touring. 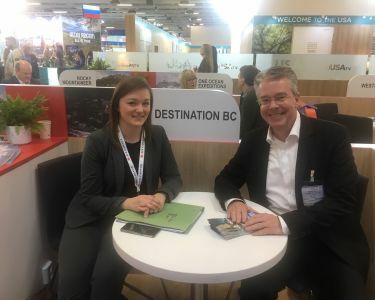 DBC also made key connections with smaller niched tour operators, travel agents and journalists who expressed interest in selling and/or promoting the destination. Finally, ITB provided a key opportunity for DBC to conduct partner meetings with Destination Canada, Tourism Kamloops, Air Canada and WestJet.